The Department of Defense (DOD) and the National Aeronautics and Space Administration (NASA) have to date elevated aerospace technologies to great heights. In a July 31, 1915, interview in Collier's Weekly, aviation pioneer Orville Wright (1871–1948) said, "The greatest use of the aeroplane [airplane] to date has been as a tremendously big factor of modern warfare." His statement could also be considered true today, along with the role played by commercial transportation in world's affairs. The victory of the United States in Operation Iraqi Freedom in 2003 illustrated the utilization of air and space to quickly quell an opponent's fighting ability. In this conflict, air and space utilization came in the form of direct air support, air to ground strategic targeting, Global Positioning System (GPS) targeting, and aerospace reconnaissance, both airplane and satellite. This utilization of air and space remains among the most powerful physical tools for ensuring national security. role. As a national icon, NASA inspires nationalism in the American people, and its achievements are projected worldwide as an exhibit of America's scientific ability. A superpower nation with a space program was historically perceived as a potential threat to other nations, as seen with the United States reaction to the launching of the Soviet Union's Sputnik during the Cold War. The nation's response was the creation of a national civilian air and space agency called NASA. 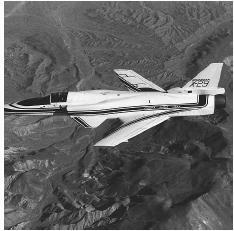 NASA aeronautical research spurred numerous advances in aviation from which the military benefited; early studies regarding lifting bodies and fly-by-wire aircraft, which used NASA-developed electronics to control the inherently unstable aircraft, are two examples. Many of the aerospace research projects at the Dryden Flight Research Center (DFRC) in California are joint projects that advance aerospace engineering, science, and develop military hardware. Some of the research involves speed of sound (sonic and supersonic) studies, aeroelastic wing research, lifting body studies, unmanned vehicles, and other proprietary research. Even though DOD and NASA have different space programs, they share numerous resources and have many joint contracts that support both the DOD program and the NASA program. These range from the simple support contracts for routine battery maintenance to expansive operations such as communications and spacecraft tracking. Both organizations share launch pads for expendable launch vehicles. Some of the expendable launch vehicles at the Kennedy Space Center (KSC) at Cape Canaveral, Florida, are the Titan, Atlas, and Delta rockets. Launch and other facilities at KSC are resources shared by NASA, the Navy, and the Air Force. NASA played a direct role in national security by providing the means to take heavy payloads into orbit. DOD has made its most direct use of NASA equipment in utilizing the Space Shuttle to bring up numerous DOD payloads. The contents of many of these payloads are classified information. There have been ten DOD dedicated shuttle launches. They are STS 51C, 51J, 27, 28, 33, 36, 38, 39, 44, and 53 (STS, which stands for Space Transportation System, also known as the Space Shuttle). Many of these missions remain secret even today, although some general knowledge about national security-based payloads has been disseminated and reported. In The Space Shuttle Roles, Missions and Accomplishments space historian David M. Harland stated that the shuttle delivered three new reconnaissance satellites in recent years. One satellite, called Lacrosse, provides all-weather vehicle-tracking capability. Another satellite included an advanced geostationary listening post. The third satellite is considered to house advanced imaging capabilities. It remains a secret as to what other DOD dedicated missions delivered to orbit or accomplished using the shuttle. Classified DOD missions continue to be carried out today, but mainly utilize the expendable launch vehicles. DOD and NASA both frequently have multiple minor payloads in addition to the major payload on a mission (both shuttle and expendable) to save costs. Some of these minor payloads are DOD sponsored payloads. At one point, the vision of routine Space Shuttle launches was so powerful that the Air Force reluctantly agreed to phase out expendable launch vehicles. The Air Force's acceptance of the shuttle came with imposing requirements on the shuttle to launch heavy payloads of up to 60,000 pounds and to provide a cargo bay of 18 meters. The shuttle's payload mass weight has been downgraded to increase its margin of safety. The failure of the shuttle to run routinely, once a week, and the Challenger accident in 1986 motivated the DOD and NASA to change the DOD's main launching platform back to the expendable launch vehicles. Department of Defense then moved to utilizing new heavy lifting expendable launch vehicles to replace the shuttle's heavy lifting capacity. These new heavy-launch expendable launch vehicles can deliver almost 50,000 pounds to low Earth orbit. Launch vehicles, including the Space Shuttle, utilize hardware that could be used for military applications such as the sophisticated guidance and navigations systems. The loss of the Space Shuttle Columbia in 2003 required personnel to retrieve instrumentation from the crash site to secure it to protect the secrecy of the technology. The most well known NASA personnel are its astronauts. Astronauts have been used to carry out the DOD dedicated Space Shuttle missions. This required the astronauts to receive training on the secret payloads in order to properly execute the mission. The classified information given to the astronauts is usually kept to a minimum of relevant required knowledge. The payloads are normally loaded into the launch vehicle at the latest possible opportunity in order to maintain security. Shuttle astronauts repaired one DOD satellite via EVA (Extra Vehicular Activity), spacewalk, when it failed to start. The majority of astronauts chosen for these missions have a military background, mostly for the flight experience. It is difficult to define to what extent NASA personnel have worked on DOD payloads because of the classified nature and the numerous joint research activities. The Air Force has had astronaut-like programs, such as the Spaceflight Engineers and the Military-Man-In-Space program. Before the shuttle, spaceflight engineers were recruited to utilize the Gemini spacecraft to go to a planned Manned Orbiting Laboratory. The orbiting laboratory was cancelled with the introduction of automated cameras on satellites. Afterwards, spaceflight engineers were Air Force pilots who would train to be the specialist that would fly on the shuttle to oversee specific DOD payloads. In January, 1985, Gary Payton (a Spaceflight Engineer) flew on the first dedicated DOD shuttle mission, STS 51C, to supervise the deployment of a classified payload. The spaceflight engineers program was later disbanded. The Military-Man-In-Space program was designed to determine the potential for humans to be used for Earth observations. Human vision and intelligence was found to be a valuable asset as remote sensors, because of man's adept ability to distinguish subtle variations in hues more accurately than cameras and film. Remote sensing from space with accurate ground truth can greatly enhance the understanding of large natural systems like forests and ocean dynamics. NASA's main role for national security is to inspire the youth of today that will populate aerospace professions in the future. This pool of technically minded persons will give the DOD a more intelligent and numerous base from which to recruit a future workforce. High-risk technologies have the potential to provide tremendous benefit for mankind. For aeronautics, NASA research divisions are positioned to study more technologies for their own benefit as well as that of the DOD, and the nation as a whole. Harland, David M. The Space Shuttle Roles, Missions and Accomplishments. New York: John Wiley & Sons Ltd, 1998. Dryden Flight Research Center. "Flight Research Milestones." < http://www.dfrc.nasa.gov/Dryden/mistone.html > (May 6, 2003).